King: 14 inches high x 76.5 inches wide x 80 inches long. 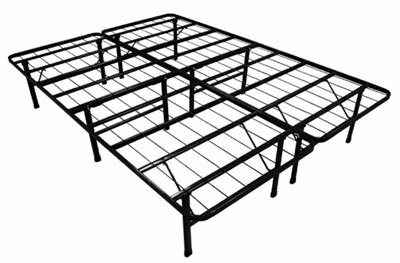 The steel base bed frame is a steel base that sits up high enough (about 14 inches off of the floor) that you do not use a box spring. The steel base comes un-assembled in a box. No tools are required to put it together. Once built, you simply place the mattress on top and you are ready to sleep. If you want to add your headboard to the frame, you will need to purchase the optional headboard bracket set. Also, if you want to add your foot board to the bed you will have to purchase an additional headboard bracket set that will work for your foot board. Each optional bracket set comes with two brackets. The Steel Base Frame comes un-assembled so there is no problem getting it upstairs, in attics, or other tight rooms that a box spring will not fit. You do not need a box spring with the Steel Base Frame so that saves money. The Steel Base Frame is easy to move. Simply unscrew it (no tools required) and move on. The Steel Base Frame sits 14 inches off of the floor. A conventional frame sits approximately 7 inches off of the floor. The additional height of the Steel Base Frame allows great storage opportunities. I have even purchased plastic tubs with lids from Wal-Mart that slide right underneath the frame. Extra storage is always nice. The Steel Base Frame is great for people on the move. It comes apart for easy moving and you do not need to drag a heavy box spring around. The metal base bed frame is a steel base that sits up high enough (about 14 inches off of the floor) that you do not use a box spring. The smart base comes un-assembled in a box. No tools are required to put it together. Once built, you simply place the mattress on top and you are ready to sleep.